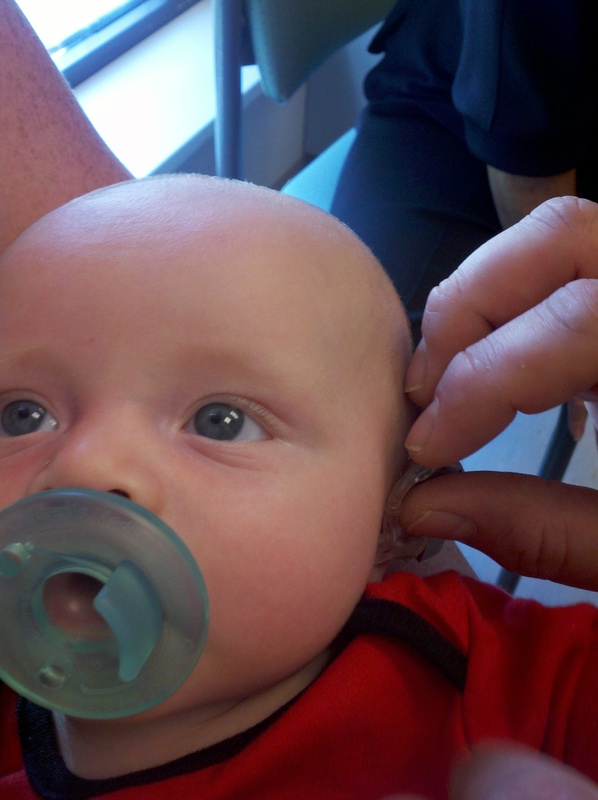 Dan putting in Finn’s hearing aid for the first time. 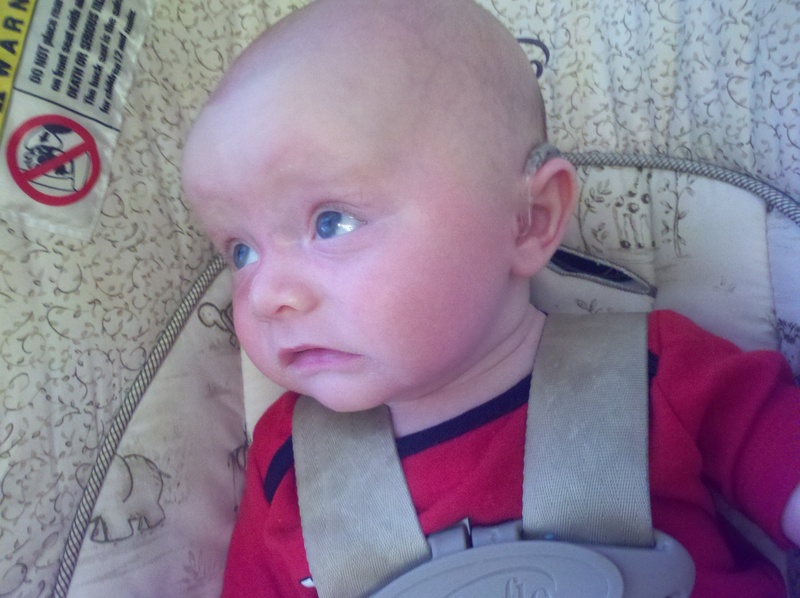 Today was a big day for Finnegan- he finally got his hearing aids!!! I say “finally”, but he is actually one of the youngest patients there to get them! It was an exciting, but overwhelming visit. 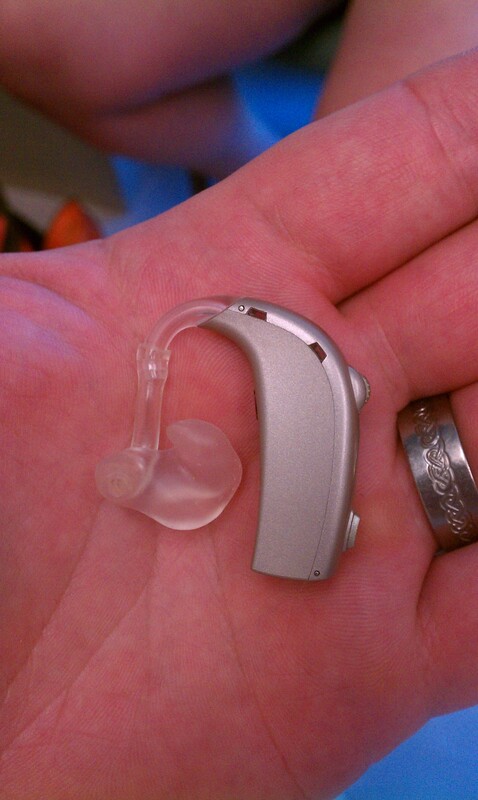 Before I go any further, I think a lot of people were confused about the role the hearing aids play in Finn’s hearing. It is exciting because they are another step in his treatment, but they do not allow him to hear. 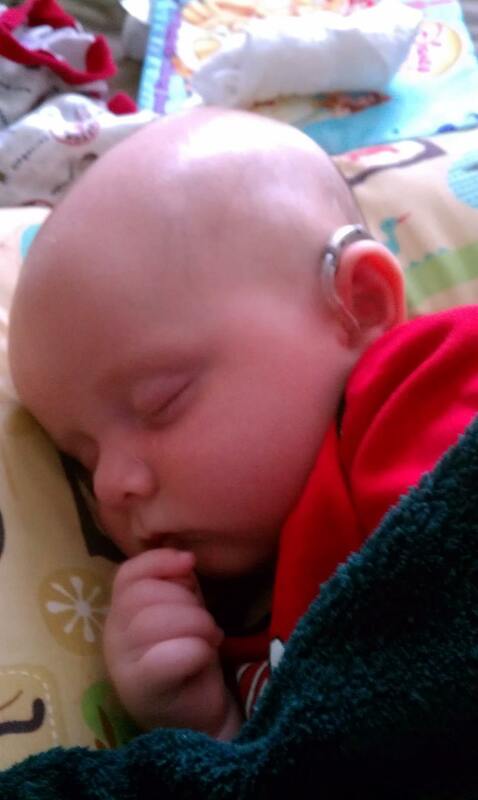 He has profound hearing loss so that means he is fully deaf and hearing aids can’t make you hear again. What these do allow for is nerve stimulation and possibly some sounds at lower frequencies. Results can be varied- a mom in our playgroup at Finn’s school said her baby girl became much more vocal, whereas some babies with this level of loss showed no reaction at all. It will be interesting to see if Finn has any reactions- he is already a pretty vocal baby so we will have to watch (or listen) closely to see if we notice any changes. 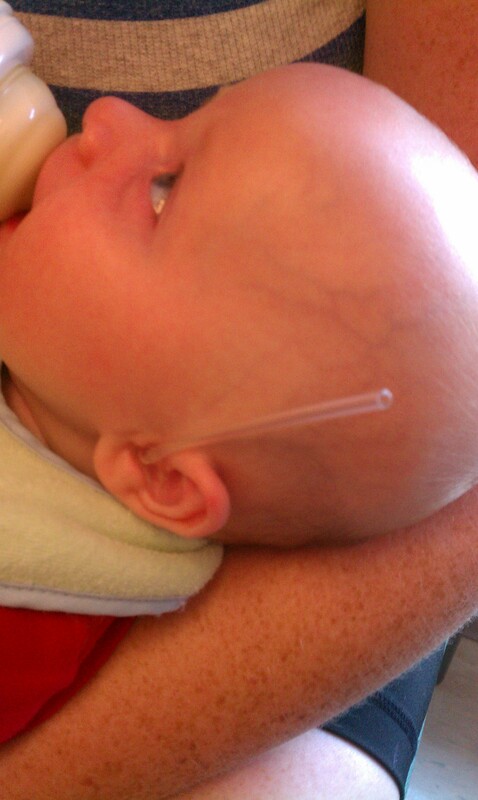 Regardless of any outward results, his nerves will be stimulated and it is another step towards Cochlear Implants! The visit today was a bit overwhelming because there was just so much information! We had to learn all about the batteries- testing them, safety, etc.- how to check the aids with a Stethoset (see below) twice daily to make sure they are working, how to clean the ear molds and attach/detach them from the aid and, most importantly, how to put them in his ear & keep them there when he starts pulling them out! 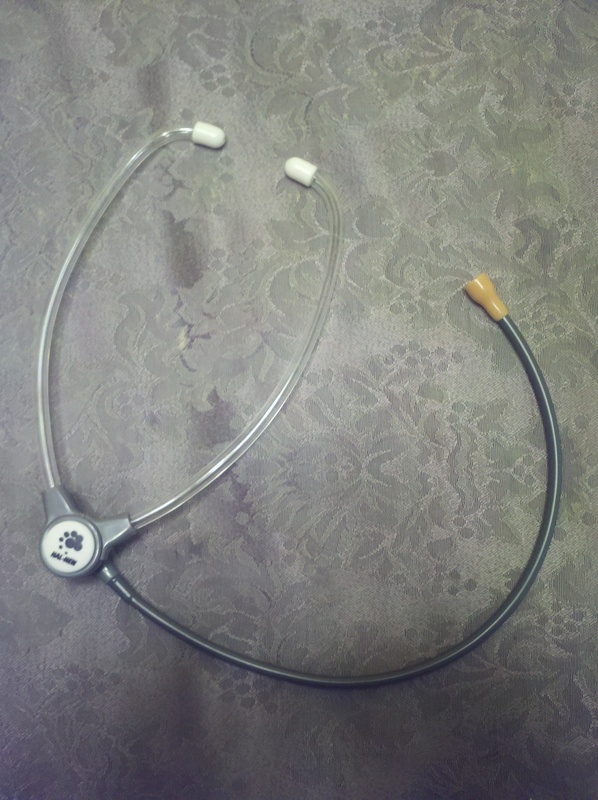 A Stethoset to “listen” to the hearing aid twice a day to make sure it is working. Cleaning spray, and tools to clean out the ear molds when they get all waxy. 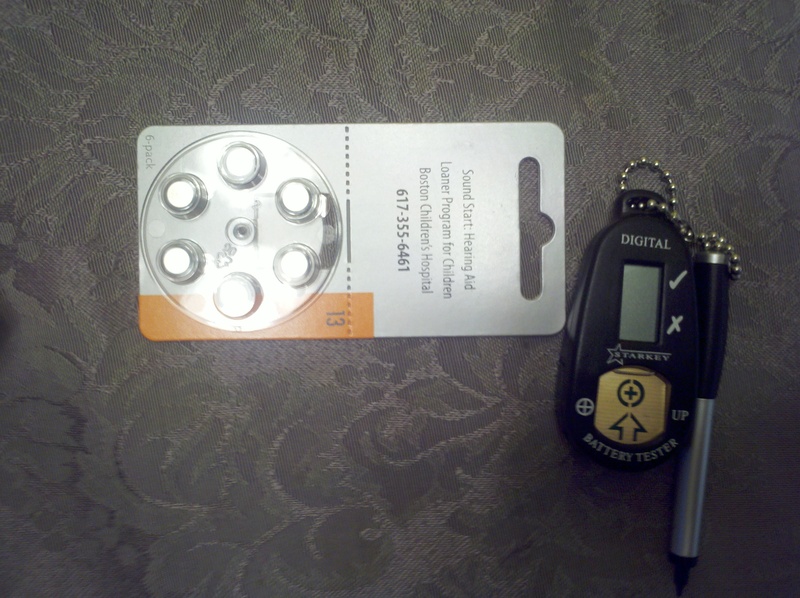 Batteries and a cool tester thingy to check them every day. 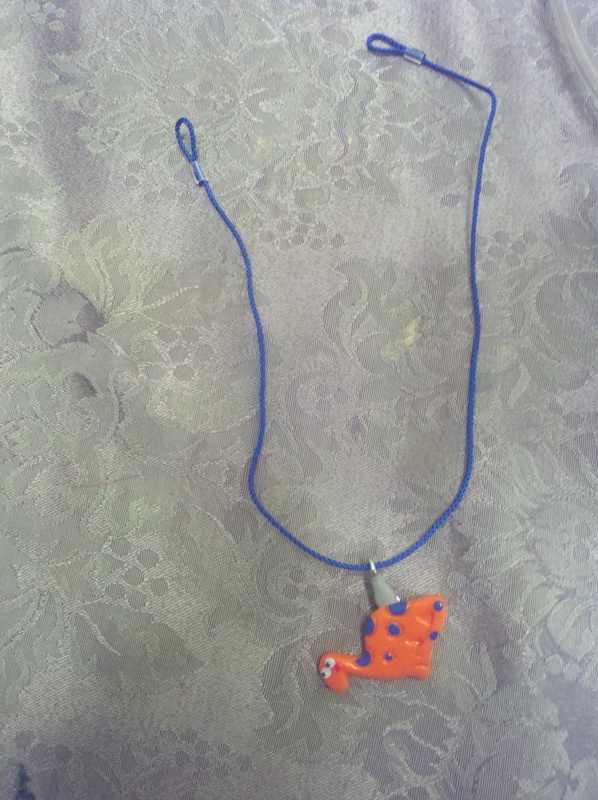 Cute clip that attaches to his shirt so if he rips them out and tosses them, we don’t lose the very expensive equipment! Close up of the ear mold—the clear silicone is an exact mold of his ear (see entry #7 to see that process) this goes right into his ear to funnel the sound from the hearing aid that has been amplified. The whole shebang. 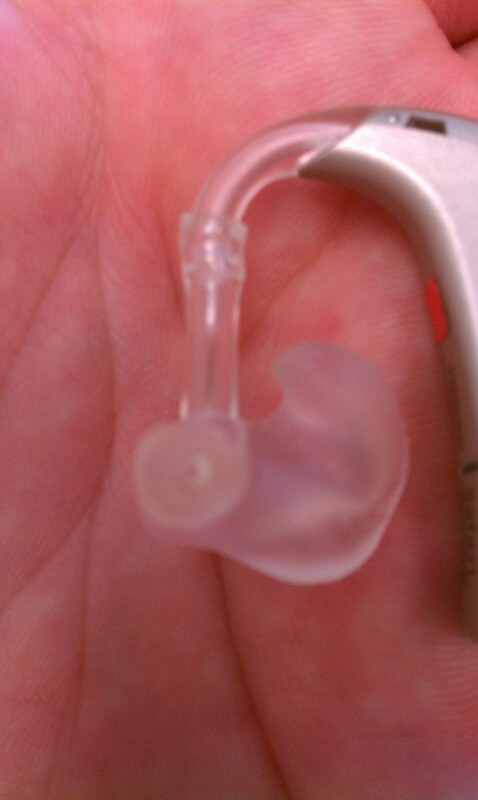 Hearing aid & mold. I am sure the next few days/weeks will be difficult at times while we adjust to the care & use of the hearing aids, but we have been assured by many people that in no time at all it becomes second nature to put them in and part of your daily routine to care for them. Speaking of other people’s input, we have been going regularly to Finn’s school and playgroup at The Learning Center for the Deaf in Framingham. It is really a fantastic program and it has a mix of all types of kids whose parents have chosen all different paths. There are kids who are hard of hearing and use hearing aids, kids who are or are not candidates for Cochlear Implants and whose parents have chosen or not chosen to go that route (and if they have gone that route, they have chosen to do the surgery at all different ages), kids who have syndromes in addition to their deafness, and kids with all types of family situations. It is nice to be able to get feedback from so many different perspectives. The old days there seemed to be this dichotomy between deaf/hard of hearing kids who used devices to hear and deaf kids who would solely rely on lip reading or sign. Nowadays, from our experience, it seems like any and all paths are supported and celebrated. Don’t get me wrong, there are still some people who are vehemently opposed to CI surgery (a comment was made that surgery isn’t necessary because deaf people aren’t “broken”) and there are others who would shame deaf parents for not choosing the surgery from their deaf child. Yes, those strong opinions exist out there- especially on the internet!- but it is not something we have really come in contact with and it seems that more and more people on both sides are open to understanding the other side of the debate. The families we have either heard about or met through The Anne Sullivan Center (EI), The Learning Center , Children’s Hospital’s Deaf & Hard of Hearing Program , have all been varied and welcoming. It really is all about making families feel comfortable, supported, and making friends! There are all kinds of events and get togethers run by these and other programs or just independently, from Deaf Appreciation week at Disney to local outings to Drumlin Farm to conferences like The Northeast Cochlear Implant Convention this month that insures all members of the family are included regardless of age or if they are hearing or deaf. Our experience has been all about getting to know other families and build the biggest support system we can with other people who understand what we are going through. It is kind of finny that Finn is getting so many opportunities to develop relationships and resources for both his developmental and social skills and he is just 3 months old! Though Dan, Kayla & I have also been able to make helpful connections. Kayla loves going to Finn’s school and joining the Deaf playgroup. She is getting great with her signs and she lip reads waaay better than Dan & I can. Her natural openness and “hands on” affection makes her an easy fit in the deaf community. She is also such an amazing big sister to Finn and continues to show a very protective attitude with him. People have been really great reinforcing her role as the big sister- Children’s always sends her home with a big sister gift and the doctor’s include her in all our conversations (at her level, of course). Family has been fantastic at acknowledging her importance- she even got a special “Big Sister” gift in the mail the other day which she was over the moon about (Thanks Aunt Betsy & Uncle Tim!!). I know we are only 3 months in, but I feel strongly that she will play a major part in how he adjusts to life in the future. Now that this step is over, the next one is the most life-changing of all! The MRI to determine if he is a candidate for Cochlear Implant Surgery!! It is only 8 DAYS AWAY!!!! We are hoping to get the results the same day, but might not get them until early the following week, but rest assure, I will be posting, blogging, calling with that news as soon as we hear anything!! That CI video with the little guy is my favorite out of all of them on Youtube too! This was a great, really clear post with awesome, easy-to-understand explanations! Moving description of your journey. Love the pics and the videos. I find that even when history shows ignorance we can take hope in the power of love and learning. Cool observation Kayla, I agree.